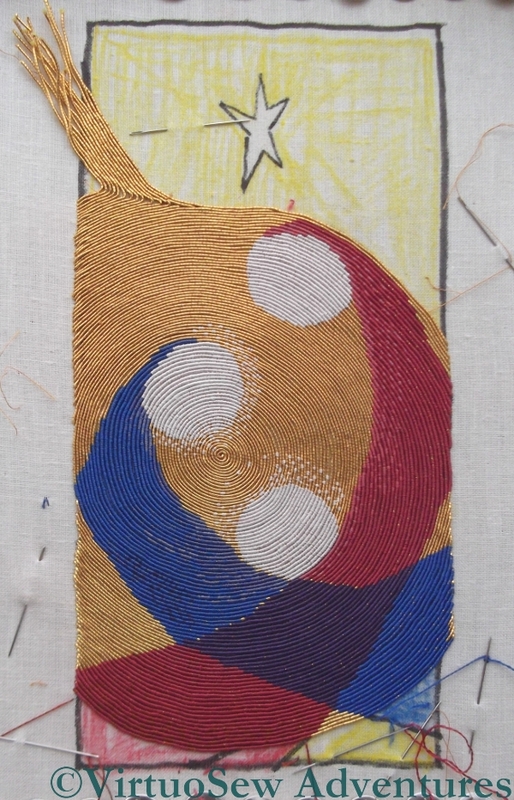 I’ve now got to the stage where I’ve started to leave uncovered gold thread at the bottom, and the sections of silk are reducing in size again. I’ve introduced a third shade of red into St Joseph’s robe, as well. It barely shows in most lights, but I think that it will make a difference in the end, by creating a sort of “ripple” in the appearance of the colour. While I’ve been stitching I’ve been trying to see whether this interpretation of my mother’s original design says something different to the other versions. What occurs to me now as I look at the photo is that the shape of the Christ Child reminds me of the many Renaissance Nativity paintings in which He is shown with arms outstretched, prefiguring the Crucifixion. I’ve also been thinking about mounting the piece when it’s finished. I went to the framing shop and looked at their gold card (all much too green), and then thought, since it’s a textile piece, maybe the mount should be textile too. There’s a fabric shop just around the corner, and although they didn’t have anything that was immediately suitable without alteration, they did have a sort of flimsy “cloth-of-gold” which gave me an idea. I’ve overlaid two layers of amber net over the cloth-of-golf in this photo, and the trimmed the edge with a piece of braid I found somewhere else. If I do this it will be nearly as much work as the embroidery was, so I’m hoping that I might have another idea soon! The pace at which this is progressing now is amazing and it looks better every time we see it. I like the framing idea but it does sound like a lot of work! I love seeing the progress of your work. 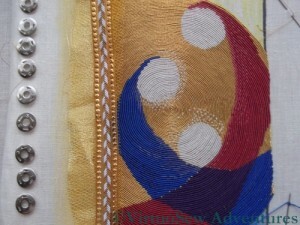 I love the intricate swirls & movement of the stitching. You must have lots of patience! What about dark green card? That would set off the red, blue, and gold. Or maybe try another couple shops to see if they have more options for framing or if they give you simpler ideas? On the other hand, it’s a lovely piece and deserves a lovely frame. big decisions to be made on that one…..good luck. Hi, I’ve been following your progress, it’s looking great. Have you considered using a black velvet mat? I think the gold and jewel tones would really shine against it. Oops, I meant a black velvet covered mat. The goldwork could be mounted on top, or behind a cut-out “window”. We get so wrapped up in the stitching that when it comes to mounting or framing it comes as a bit of a shock at all the work involved. But getting this right can make or break the piece. My advice, audition a number of solutions. You will know which one is right when you see it. This is looking more lovely every time you show it. I love the whole flow of the design and the colors are magnificent. This really deserves the right frame. I am firmly of the opinion that time spent in planning the mount and frame is seldom wasted. It might be worth looking at gift wrap and string/cord/ribbon as well as craft papers and foil. It’s such a beautiful piece that it does deserve to be mounted well – don’t ask me how or what! Am sure you’ll make the right decision in the end. I love your sampler work on your previous post too. I am in awe of how much attention to detail you put into all that you do. The border is just perfect – opulent to match the flash of the gold, the white to pick up on the white in the piece, and gold to match the er, gold. It must sparkle so much! That framing looks gorgeous – but for your sake, I hope you can think of something quicker that looks just as stunning!